I regularly follow practicalmachinist.com forums. Especially the cnc machining section of it. I notice when CNC Speeds and Feeds questions come up people often suggest my HSMAdvisor Machinist calculator. A referral by a satisfied customer is the best referral in my opinion. Thank you to everyone doing this great favor to me and my prospective users! Other times users of HSMAdvisor question speeds and feeds it generates and instead of going to me, they ask on forums. In the process of discussion it usually turns out that the calculation results were correct, but because user decided to use a depth of cut or tool length, larger than he should have, HSMAdvisor compensates and gives a very conservative feed rate. Just like in this forum post over here: Engraving with a 1/32 ball mill machinist wanted to use a 1/32" ballnose endmill to engrave 304 Stainless Steel at 0.010" depth of cut. Material is 304 laser cut, machine is a Haas VF-6SS with a 12k spindle. Obviously spinning at 12k, but what would everyone's feed be at .01" deep? HSMAdvisor always seems to me to be very low on these numbers (1.41 IPM? Yes this is with chip thinning turned on). Tool has a 1/4" shank and a real short flute length, solid carbide AlTiN coated. Naturally HSMAdvisor was not too happy and suggested a very low feedate for such an operation. Proper depth of cut would be about 0.002" for such a small tool and it would yield a much faster cutting rate. 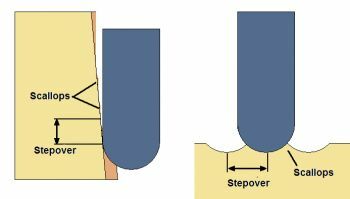 Eventually, though, machinists who have run similar jobs pointed out that the Depth of Cut was excessive for such a tool/material combination and suggested both larger tool and shallower depth of cut. Why .010 deep with a 1/32? Why not .005 with a 1/16 and triple your feedrate? That sounds deep to me as well. I end up going only a few thou deep to get a pretty decent width line. Sneak up on it, and either ramp in or slow down the plunge like Haazart said. Eventually the original poster changed to a 1/16" ballnose and 0.005" depth of cut. Edit: got the part indicated with a tenths test indicator (I have a VERY short flat to work with) within two tenths end to end, and checked the flatness of the part. Around the area to be engraved it's all within five tenths. Should work okay. Wish I could take a photo to show, but it came out awesome. 12k, 10.7 IPM, .005" deep. That's exactly what HSMAdvisor suggests for a 1/16 ballnose and it apparently worked out awesome! Thank you, Atomkinder for the follow up on the results of your machining!